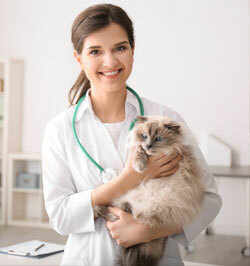 Your pet will receive a physical examination by Dr. Ken, in house pre-anesthetic blood work, I.V. catheter with fluids, and pain medications before anesthesia and surgery. Your pet will be monitored through instrumentation and a veterinary staff member throughout the anesthetic/surgical procedure. Tanner Lakes Animal Clinic treats your pet as we would our own. Pre-anesthetic blood testing is important in reducing the risk of anesthesia and alerts us to underlying internal conditions that are undetectable on a physical examination. This profile screens for Diabetes, anemia, as well as assessing the liver and kidney function of your pet. If we have not performed blood work within the past 30 days, this blood profile will be run before the procedure. At Tanner Lakes Animal Clinic, every anesthetized patient will receive an I.V. catheter for fluid and drug administration. Fluid administration will maintain hydration status as well as blood pressure. Pets recover faster and have fewer complications when pain and stress are minimized. Injectable pain medications are used in the clinic and 3-5 days of oral medication is dispensed for post operative administration at home. Do I feed my pet before surgery? It is important to withhold food for 8-10 hours before surgery. Water can be left down for your pet. Will my pet need to have stitches removed? Most surgical procedures utilize dissolvable sutures which do not require removal. If your pet has external skin stitches, they will be removed 10-14 days after surgery. Will my pet stay over night after surgery? Almost all surgery patients are released the same day of surgery. Once surgery is completed, a staff member will call you and let you know when you may pick up your pet. What time should I drop off my pet for surgery? Patients may be presented between 7 A.M. and 9 A.M. for surgery. Also, allot 5 minutes or so to read and sign an anesthesia consent form. Can a microchip be implanted or my pet's teeth cleaned while under anesthesia? Sure! Nail trims, ear cleaning, dental cleanings, microchip implantation may all be performed while your pet is under anesthesia. On the second page of the anesthesia consent form is a list of ancillary procedures you may choose for your pet. Does my pet require special care after surgery? When you pick up your pet after surgery you can also plan to spend about 5-10 minutes to go over your pet's home care needs. In the meantime, please don't hesitate to call us with any questions about your pet's health or surgery.